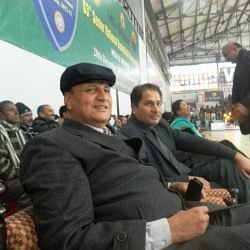 Ram Kumar is a former Indian basketball player and one of the most successful coaches in the country after retirement in 2003. The 2003 Dhyan Chand Awardee is the son of Khushi Ram, also a former Indian basketball player and an Arjuna Awardee. You have been one of India’s finest players and were the Head Coach of the Indian Railways men’s team for many years. Going purely by records, you are one of India’s most successful coaches. Your father Khushi Ram, is widely considered among India’s all time greats. Your brother, Ashok Kumar has represented the country. In fact, all three of you have been former India captains. What is the reason behind the phenomenal success of your family in basketball? Look, there are things that we have learnt from our father that has kept us in good stead. We have observed his routine closely, mainly, his simplicity, discipline and dedication to work. These are the three things that I have adopted from my father. At the end of the day, whatever adulation you get, it is by God’s grace. For example, I was lucky to not have suffered any career threatening injury, or having to face other adverse circumstances which could have led me to miss my training or make me unavailable to participate in important tournaments. We also got good facilities which we availed fully. The atmosphere was such that we could pay undivided attention to the game of basketball. This is true for my brother as well. Even he has led a very simple, disciplined life and trained well. Our families have supported us wholly, especially my father, mother and wife. When you play or coach, you have to constantly be away from your family. You need someone to be responsible for the household. Even that is critical. If my wife had not been co-operative or supportive, how would my success have been possible? You say that you have had good facilities at your disposal during your playing days. But from what we hear from today’s players is that the facilities during 70s, 80s or even 90s pale in comparison to current times. Am I correct in saying this? Nowadays you have indoor courts, air conditioned halls…. See, even for the facilities that we had at that point of time, a lot of players were deprived of them. At least we were fortunate that way. We had a ground inside our colony at a walking distance just 5 minutes away. The entry was free. Nowadays, if you live in cities like Delhi or Bombay, you won’t even get a ground to practice on! You will have to travel for hours each day. Our situation was not like that. It was excellent that way. We had a lovely basketball court, a stadium, a gym and virtually all the sports facilities you could possibly imagine. And I am talking of a long time ago! Another helpful factor was that I used to practice with a team of a considerably high standard. Your schooling was in Kapurthala, wasn’t it? No, no. I was in Kota, Rajasthan at a school called Shri Ram Vidyalaya. I started playing basketball in 9th standard, in the year 1977. I’ve also heard a great deal that there is a basketball culture in Kota. Not any more! There was a culture during my time. There were many colleges then that had good teams. Shriram Rayons, the former top professional team in our country was based at Kota. Many top players have played for Rayons. My father used to play for them as well as Hanuman Singh Ji, Ajmer Singh Ji, the Arjuna Awardee International Surendra Kumar Kataria Ji and Olympian Paramjit Singh Ji. Although these players were only there for short spells, the fact is that the country’s best players were all in Kota at one point of time. This is why Kota had such a strong basketball culture. What has been your strategy when it comes to coaching? Has your playing experience over so many years helped you become a better coach? Definitely, all those experiences from my playing days helped. Although it’s impossible to pass on all your internal feelings to the current players, my playing experience has been immensely useful in teaching the finer aspects of the game. The fact that I myself once played at the level that I am now coaching has been useful. Normally a coach is near the officiating table and can call for time-outs and make substitutions. In this tournament, the organisers have restricted the impact of coaches and kept us at a distance. While we still can signal to players for substitutions and other strategies, in our case we had prepared our strategies before the match itself. 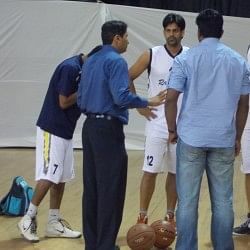 PREGAME STRATEGIES: Coach Ram Kumar with his Railways squad prior to the tip off of the finals of the inaugural 3 on 3 National Championships. Railways ended up as first runners up, losing to Tamil Nadu in overtime. Let’s also not forget that this is first time we are hosting a 3 on 3 tournament at the national level. Players haven’t yet got a handle on the game. The rules are quite different. Slowly, you will find an improvement in the way we coach and play this format of the game. So, the involvement of a coach is markedly limited in a 3 on 3 tournament? The involvement is less during the course of the actual game. But during practice, our workload remains the same. Before coming here, our team (the Indian Railways) had a practice camp at the Rail Coach Factory, Kapurthala for about ten days. It was a short camp, but I tried to ensure that my players worked as hard as I used to! The main training of the Railways happens in Lucknow, I suppose? It used to be, but not any more. When I used to play, we used to have our camps in Lucknow. These days, the bulk of the training happens in Rail Coach Factory (RCF), Kapurthala, where I’m currently posted. We have constructed a good outdoor court with cushioned, synthetic flooring. What is your take on the 3 on 3 format? Does it benefit players? This is a new concept. This will be of more help to junior players, as it will help them in self-decision making, since the coaches are least involved. Another benefit is that 3 on 3 is always about defence. In a full court game, defences are absent during fast break situations. In 3 on 3, this is impossible. You always have to score over a defender. So, the 3 on 3 format is excellent for skill development. There is a tendency these days in many major Indian sports such as hockey, cricket and basketball to contract foreign coaches and support staff. Is this a good development? This is the age of globalisation. The technology at the disposal of foreign coaches is also available with us. Of course, if a particular foreign coach already possesses the experience of having coached a big side, he can be of value to us in India. But in the same breath, you should also not underestimate the ability of Indian coaches in understanding the tendency and needs of Indian players. Indian coaches are sent abroad for training and in fact, coach side by side with the foreign coaches. For the time being, of course it is a good thing that we have foreign coaches who can bring a positive improvement to our teams. I am of the opinion that Indian Coaches can assist them for now and later on be at the helm of affairs. On a different note, a lot of people are unaware that you and Ajmer Singh Ji were contemporaries and played together in the Indian National squad. It is very rare to have two superstars playing simultaneously on the same team at the prime of their careers. Can you describe to us what sort of player Ajmer Singh Ji was? I have played with him, and my judgement mirrors that of others who have seen him play. No player has been born in India ever since, who has played like him. He is incomparable. He was a specialist in one on one situations. A master! No single player could stop him. Another key trait was his passion for defence and rebounding. He was an all-round player. Even if one were to look at his achievements, you would notice that he scored against the best teams in Asia and found a place for himself among the top ten scorers at the Olympics. His distinctive style of play has never been seen in any other player after him. What style are you referring to? The ability to back a defender down in the post and make a turn around jumper. He created a gap in such a way that it was impossible for a defender to block the shot, even if he was a seven footer. My father had the same move which he then taught him. I never really saw my father play as I was very young and didn’t possess too much understanding about basketball. But Ajmer Singh is someone I watched closely. I not only played with him, but in training sessions, I also used to play against him. To score against him when he was guarding you was very difficult, even with a teammate’s help. Well, in that case, you must have been glad that you and AjmerJi played at different positions. Ajmer Singh was in the post, while you were a shooting guard. So, I’m sure you would have got enough scoring opportunities! Yes. It’s true. Our positions were different. You are at a unique vantage point as you have seen three generations of players. Your father was one of the greatest players of all time. You and your brother were dominant in your day. Now you are coaching the best Indian players. 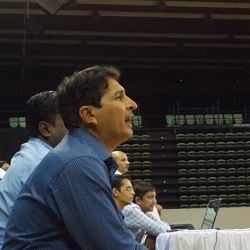 Through all these years, what changes have you observed in Indian basketball? BFI’s tie up with IMG Reliance during the late Harish Sharma’s tenure brought about a major change. This inaugural 3 on 3 tournament is an excellent development as well. In the last decade, the accommodation for players and the way events and tournaments are being organised, has all undergone a positive overhaul. Last question. You are a role model to all Indian youngsters who want to play basketball today. If there is one piece of advice you can give them, what will that be? Definitely play. I will tell the youth to engage in physical activities no matter what happens. Even if they don’t end up as trendsetting athletes, their lives will become more disciplined. They will at least stay away from alcoholism, drugs and bad company. Nice interview..a great achiever and a role model too..